I’m sure by now you’ve all heard of the KonMari Method for decluttering. 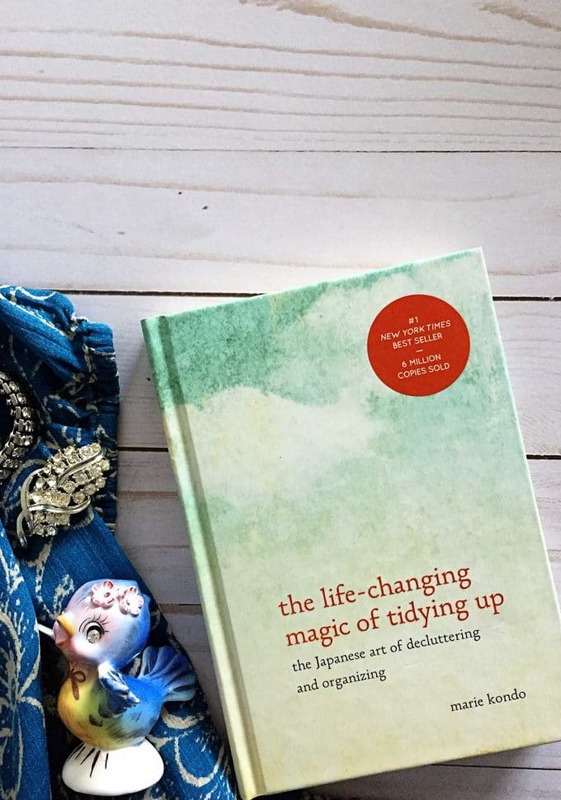 It is from the book called The Life-Changing Magic Of Tidying Up: The Japanese Art Of Decluttering And Organizing, written by Marie Kondo (that’s an affiliate link, btw You can read my full disclosure policy here.). But, can we thrift store shoppers, estate sale lovers and yard sale junkies do the KonMari Method successfully? Is it just in our nature to be packrats? 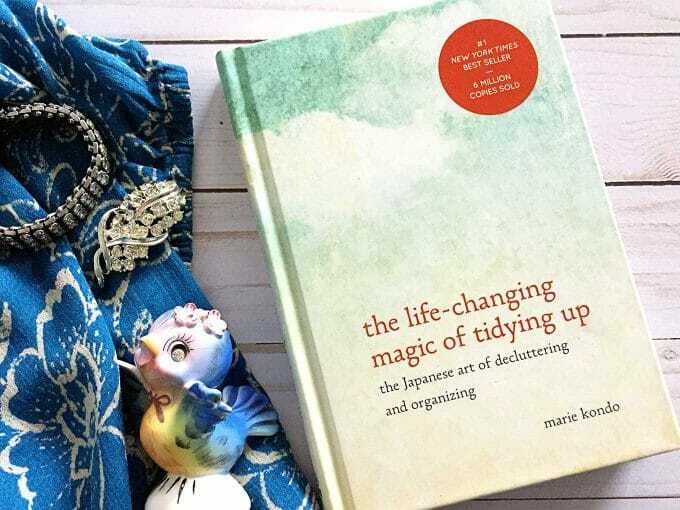 Or can we Lovers Of Thrifty Treasures learn a new trick to make our lives more organized? So let’s start with the very very basics of the program. Marie Kondo wrote a whole book about the process, so I’m just going to summarize a few key points for you in case you haven’t read it, before I get into how I made her plan work for me. The idea is to do this thoroughly and all at once and bask in the huge impact it makes. This will cause you to totally change your thinking and not backslide. You will NOT have to declutter yearly, it’s a one and done type of thing. Can I have a Hallelujah on that! You really have no idea how much stuff you own until you gather it ALL together in one place at one time. So you are not going to purge and organize the bathroom and then go on to the bedroom etc. You will tidy up in 5 different categories, starting with the easiest category and ending with the hardest category (and Boy, is #5 the hardest). Only after you are done discarding can you get on to organizing what is left. 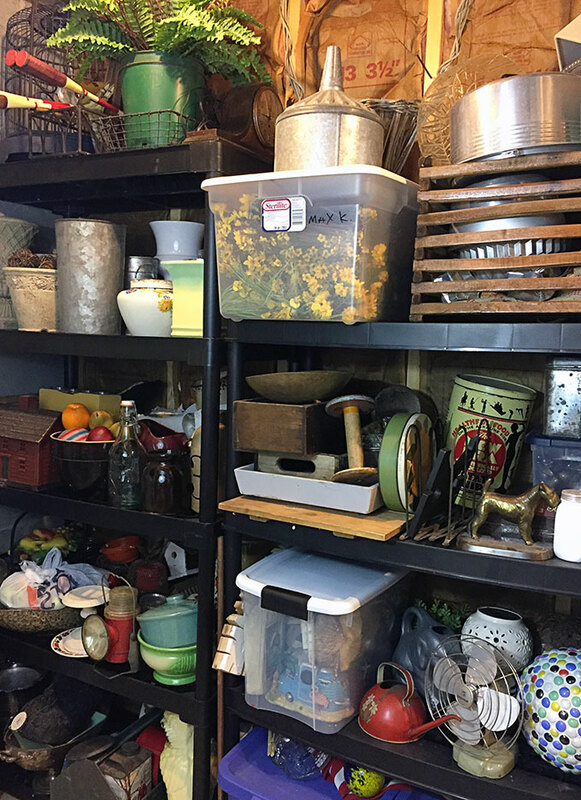 Trying to organize while discarding will get you off track and pretty soon you will be wondering how you can store all this stuff, where can I buy cute storage containers and what’s for lunch. And you never return to your original task – discarding. Remember, your goal is to get rid of this stuff, not find new ways to store it. To decide what to keep and what to discard, you need to gather all your items in that category from all over the house (let’s say clothes) into one area and dump them into a pile on the floor. Then pick up each item, hold it in your hands, examine it and and if that item sparks joy you will keep it. If not, you will thank it for its service and discard it. You want to surround yourself with things that make you happy and you honestly want in your life. Why surround yourself with things that give you negative feelings or you are holding onto because you think you have to. Basically if it doesn’t make you happy, it’s outta here! Now supposedly by doing this not only will you declutter and organize your home, you will ultimately change your life. You will have more confidence in your decision-making skills and gain confidence in life. You will lose weight, your skin will clear up, you will find a new career and husband and live happily ever after. All because you have surrounded yourself with only the things that make you feel happy. I do have to say that it is a little freeing to let go of stuff. I can remember as a child when my mom would help me spring clean my room once a year and we would clean and organize the room from head to toe. It was such a great feeling to walk back into that room and see it so organized and tidy. So I do think she has something there, but she just takes it a little too far down the crazy train with the weight loss and all that. Now here comes the problem we have as thrifters. EVERYTHING bring us joy! I know you didn’t want to hear that, but the truth is that the less I shop at thrift stores, the less I bring home. When I’m out at a thrift store and see something I would have bought in a hot second before I read this book, I now take a step back. I will pick it up, hold it for a few minutes and decide if I really really need this in my life. Does it bring me joy? Is it something I will use long term in my home? If the answers are yes, I will buy it. But a lot of the time, I find that it’s the thrill of the hunt that I enjoy. I get a kick out of walking into a thrift store, finding something unique that really shouldn’t be there and seeing that ridiculously low price. That’s what is sparking my joy, more than the actual item. So in this case, I’ll thank it for the thrill it gave me and put it right back on the shelf so it can give another shopper that same thrill. I have a shelving unit (OK, 2 of them) in my basement where I store home decor pieces and thrifted items that I’m not currently using. A lot of times I will buy something, use it in a vignette, then put it away in the basement when something else catches my eye at the thrift store. I don’t want to get rid of the item at that point because I still like it, it’s still sparking joy and I may use it again soon. I just don’t have room for it right now, so off it goes to my holding area. Occasionally I’ll go down to the basement to bring it back up for another area in the house. And then sometimes I realize I probably won’t use it again. Either way, it’s nice to have it all in one area so I can quickly inventory my stash see what needs to stay and what needs to go. Oh and it’s important to say (can’t believe I almost forgot this), I limit myself to those 2 shelving units. If I bring something downstairs and there is no more room left on the shelves, then something has to be taken off the shelves and put in the donate/sell pile before I put that item on the shelf. Not only do I rotate my items from the upstairs to the basement storage area, I also tend to rotate my thrifted home decor items in and out of my life. As long as I haven’t spent more than a few bucks on an item, I don’t feel guilty sending it back off to the thrift store or yard sale pile if I’m done with it. These things are meant to be loved and have joy sparking all around them, so let them be free and run wild in someone else’s home for a while. I got very, very nervous when I kept reading Marie Kondo discussing all the garbage bags of belongings she removed from people’s houses. Eeek! I have a vision in my head of mounds and mounds of perfectly usable “garbage”, piled 200 foot high, clogging our landfills. Now, I bought this book over a year ago. Yes, you heard this right, I’ve been at this for 1 YEAR and I’m just getting around to telling you about my experience. Basically, because I find it takes a good year to do the process, live with your new setup and then find out if you can stick with the program. I didn’t want to be like the girl who loses 100 pounds and then in 6 months gains that amount back plus 20, but she’s still talking about Jenny Craig. Have you tried the KonMari Method? What are your thoughts on it? his way in the world. My oldest daughter got married to an Airman and moved over seas to Japan two months ago and our middle daughter is on the opposite side of the country finishing her PhD degree. My husband started off the year with a new job that requires a home office so the basement (that had always been the kids domain) became the office and my creative space. I have stuff. I mean I have STUFF. I was brutal when donating or selling my items that no longer had a place in my life….but the kids? I just can’t bring myself the say, “Hey Son, so proud of you for serving our country by the way I sold all your toy tractors and Legos. Or “Hello sweetie, how is your research going, just a note I sold the American Girl doll and The Barbies.” It has been an eventful year with lots of changes and the house is reflecting that change….but for a little while longer, I guess I’m stuck with some stuff. I will be honest–I thought that book was funny. Thanking my socks and stuff. I have to purge and am well aware of it, but some of the stuff was a little kooky. After the person who cares about my stuff is no longer here, I will be able to get rid of stuff. But she takes inventory every time she visits. I have that book, too. Since I am no longer selling, I buy much differently…today I went to one of my favorite big thrift stores and actually found some great items…but I didn’t buy one thing. I still had a fun time, but I am being much pickier about what I want and need. Great post! I have not read the book, but have read many others’ take on it. 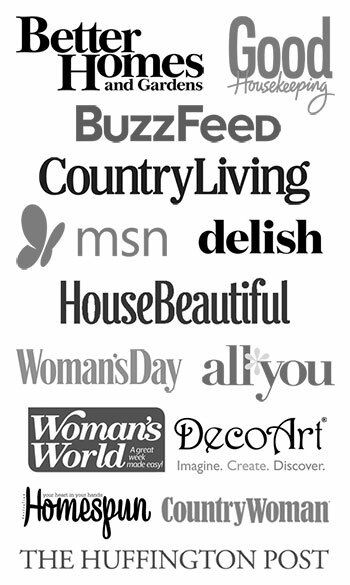 I have pondered a lot about the visual and emotional impact of putting everything of one category in one big heap. I’m guessing it would quickly change my thinking from that of lack to that of over-abundance (“I have nothing to wear” to “why the heck do I have so many clothes?”) Don’t even get me started on books (mostly my husband’s)! Just this week when thrifting I considered several items but put them back because of this thinking. I forgot to thank them, however. I haven’t read the book. But I don’t seem to have a problem purging or getting things in order. Of course it’s much easier if you live alone like me! That’s awesome! I’ve never stayed in one place for this long before, so I haven’t gotten to do my normal “hey, I’m going to move, so I need to weed out my stuff rather than pack it” routine for a while 🙂 I think that is part of the reason why I had so much stuff. I’m just used to weeding it out naturally every few years. Oy, I would probably have to spend the next 3 years just making piles. There are 4 people in my house and 3 are packrats. Every time I get one room de-junked someone comes along and says, “Oooooo, empty space! Maybe I should check and see if my husband and these adult children are sparking joy. Ooooo, sparks! That gives me an idea….bonfire. I am so impressed that you limit yourself to two storage shelving units. Our basement is about 1200 square feet and it IS a storage unit. Pam, if you are ever in Connecticut, feel free to shop my basement. I would LOVE to shop your basement! My 2 storage units don’t count my holiday decor though. That’s a whole other ballgame, but I did weed it down a LOT and organize the heck out of what I did keep, so I’m feeling very comfortable (and full of joy) about that! 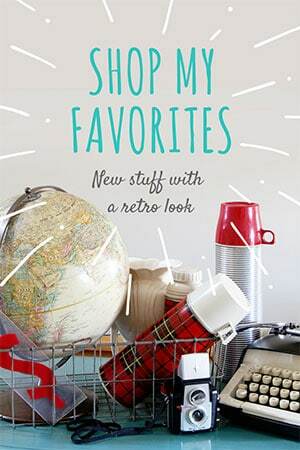 You’ve got some good practices when going to thrift stores/yard sales, etc. while shopping. I think it IS more the thrill of the hunt than the actual item. This is me at thrift stores, “I want that, but I don’t NEED it. I want it. No, you don’t need that. Don’t buy that. It might not sell, then you’re stuck with it.” Or I’ll get it home, and say, “what did you buy this for”? There is no easy answer. I have an inventory full of those things. (that I’m stuck with.) And yes, I know I can re-donate them, and often do, but first they go in a yard sale for some other poor soul to find…LOL. I’m picturing you arguing with yourself at the thrift store now 🙂 I think it’s gotta be extra hard when you are buying for resale! Sometimes what will sell well isn’t necessarily your style, so you’re “stuck” with things that are not bringing you joy until you can sell them! i read the book. my enthusiasim for the methods there only lasted briefly. but like you my thrifted items can be temporary. so i got rid of a 35lb box of coffee and tea mugs yesterday. good luck with your efforts. I work at an all-volunteer thrift store, all income benefits our community members. When I first started there at least eight years ago, oh my, I was in HEAVEN! The ladies told me, with time, that feeling would pass. It has. The things people bring in to donate, some very nice things, family treasures. One person’s beloved items are another’s ‘Why would I want to keep this?’. I am aware of the book and its philosophy, am trying to live with less. Have become much more picky, more often than not, leaving a treasure for someone else to enjoy. For me, some of my treasures spark a happy, love-filled memory, so they definitely stay. I still have way too much stuff, but I am much better at going to a store, loving something that is a great price, and saying to myself, I don’t need it and I move on. Just like you said, sometimes it is the thrill of the hunt! Now I just have to purge what I have, which I am working on. Since it is mostly antiques/vintage it’s a bit more difficult for me! I am half way through the book. I also love thrift stores. The majority of the things in our apartment are thrifted. Unfortunately, I am drowning in my collections. I have stuff stored in our garage, in closets, under beds and in my son’s room. Having so much stuff is causing me anxiety and frustration. My problem is that I am sentimental and I drive myself crazy wondering if I will need an item in the future. I used to buy anything I liked, but now I severely restrict my buying. I have to really need the item or I have to hear angels singing and the item has to be bathed in celestial rays of light. I am nervous about getting rid of stuff, but I am tired of not being able to enjoy my apartment because I’m using it as a warehouse. I feel you!!! I am lucky enough to have a little office/craft area off my bedroom, but I couldn’t really enjoy the space because it was my dumping grounds for stuff I had bought for when I open my antiques booth. Or open my etsy shop. Or open whatever. It was just getting ridiculous. It felt soooo good to get that area under control. I kept a small portion of it, but the majority of it went off to Goodwill. She wrote it from a very Old Age of thinking. She is Shinto and follows that belief system. And yes, it was never intended for English audiences originally. And you are the 1st person who introduced me to that book. Thank you! I’m not sure I can get behind her methods 100%. However I do organize and purge on a regular basis here and I have managed to calm some of the stress I felt at owning too much stuff simply by regularly donating things we no longer use or want. Yesterday I took a stack of books to Half Price to sell – $21 richer and I was originally going to just donate them. I keep forgetting about Half-Price Books!!! I’m going to add that to my list of places to take your discarded stuff! Absolutely perfect timing… as I’m starting to purge and organize my house to make it ready to list it. Also, I don’t want to move THAT much stuff. You have 2 shelves of thrifted goods? I have 10 in the house, 3 in the garage, and HALF of my garage full of larger items. I have until the first week of March. This will be a challenge. Yes, finish the book. It’s going to be a fun challenge though. I do think you have to have a whole different criteria for paring down your resale stuff though, because “sparking joy” isn’t the best measure in that instance. Just let me know if you start talking to your socks though, so I can reel you back in 🙂 And hey, let me know if you do a post on it when you’re done and I’ll add a link to it at the end of the article. Oh boy, just what I didn’t want to hear much less admit. Yes, I’m a thrift store, garage sale junkie. But, there’s something freeing about just being able to admit it! I will personally be trying like heck to Purge everything I can this year as we are going to try and sell our house and I definitely don’t want to have to lug all of it to the next house. Wish me luck? Months before Kondo’s book came out, I was sorting my crafty supplies ruthlessly. I also attacked the kitchen. There was plenty I didn’t think I’d use any longer. I packed plenty of boxes of stuff that had to go. Then, we moved. I have a feeling that because I cleared the clutter, we opened ourselves to some really good energy. We decided to move whether or not my wife got a full-time job. I cleared the clutter, my wife got the full-time job, and we bought a house. Shortly after that, we bought a new car. Life has been very good to us. After a year, we feel financially stable, and we are working to make the house the way we want it to look. We have to save to re-do the two full baths, the kitchen and replace the yucky new laminate flooring, but we are painting and thinking about decor. We brought our cast-offs and had a yard sale and made lots of money. We also brought a bunch of decor that we didn’t even open at the last house, because I knew it wouldn’t go. Soon, we will open those boxes. If we use them, they stay, if not, they won’t. We will need to ready for the next yard sale. It takes time, because my wife works full time (yay! ), and I’m not very mobile. But, we’re chugging along. Merely mentioning Kondo’s book made me think of a recent podcast we listened to. It isn’t for those whose ears are “sensitive”, so here’s the tiny url so no one has to see the name of the book unless they click on the link. http://tinyurl.com/hkjk6jw I must say that this made more sense. It’s not about the stuff, but how you deal with life. Maybe you can find the podcast or reviews. Great tips for my favorite hobby of junking I call it! I recently stumbled upon my first hoarder’s estate sale. It was so upsetting to think someone could collect so much “stuff”! I came home and immediately started purging! That’ll do it to you 🙂 I once went to a garage sale where the garage was packed to the rafters with all sorts of stuff, yet everything was priced at antique store prices. He told me his wife wanted him to get rid of stuff so she could park in the garage again. I ended up not buying anything there because of the prices, but I saw him at an auction a few weeks later where HE WAS BUYING even more stuff. I’m pretty sure his wife never got to park in the garage! really loved surfing around your weblkog posts. I love thrifting for mid-century treasure and enjoy organizing my space. But even before this book came out, I knew I had a problem even though I’m always donating outgrowns, kid toys, etc to thrift shops (and then going right back into the thrift store for the thrill of the hunt). The problem was that it’s simply too easy to acquire mid-century treasures. I had vintage Pyrex (way too many nesting bowls taking up space), milk glass, a massive collection of Franciscan dishware, vintage ephemera, a beautiful and unique framed crewel needlepoint from an estate sale, and on and on. I had run out of space. Also, as the owner of a tiny home (hey, it’s Silicon Valley, we all bought $1M+ small, ugly homes with no attics or basements), I have little space to display my treasures and didn’t want my place to look like a garage sale. I could have opened my own Etsy shop or had a stall in a cottage shop! But nope, instead, I did the unthinkable and gave all but my most treasure pieces away to Savers, the Discovery Shop, etc. Didn’t sell on Craigslist or eBay, just made 15 trips to these thrift shops and gave it away. I saw some of my former things at a shabby chic shop nearby the following day. What remains, I highly treasure and use all the time. Less stuff, more joy! I think I will still hunt at thrift shops but I will be a lot more selective. It’s more about the experience of the hunt than it is the bringing home of more treasures to my too-small home. I don’t do this with knicknacks but maybe I should. When I go shopping (although usually AFTER shopping), I find the things in my closet that I like the least. I don’t let myself buy more hangers, so whenever I buy new clothes I have to get rid of the old ones. If you have a tendency to collect thrift store decor, maybe try coming home AFTER you bought things and make yourself get rid of the same number of things you bought. I appreciate the KonMari method but for me, asking myself “what do I hate the most of my stuff” or “what do I like the least” makes it easier to get rid of a few things at a time. And I feel less guilty about making new purchases! I Spy a Terrier Statue on your shelf, think it needs a new home? I Do! Just seeing it sparked Joy in me. I discovered Kondo on Netflix and have watched each segment. Some curious ideas yes, I do not fold my socks but do touch my books to wake them up. If you would like to sell Terrier just email, I can always love more Terrier pretties! I just finished reading both her books that I took out of the library. I had already been working on cleaning out as I retired a couple years ago from my full time job and had worked part time since retirement and now I am not working at all so have lots more time on my hands. I have taken her methods into consideration and it has helped. I find I am not running out to the stores just to look as much, and if I go to the thrift store i am very careful about bringing anything home. Recently I bought two cute little glasses with summer motifs on them. Now I’m working on all the piles of papers and it’s something I’ve put off for years. The KonMari method is what has kept me on task, otherwise I would have given up. When I was working full time and our four kids were involved in all kinds of activities I would just move piles of papers aside to take care of sometime. 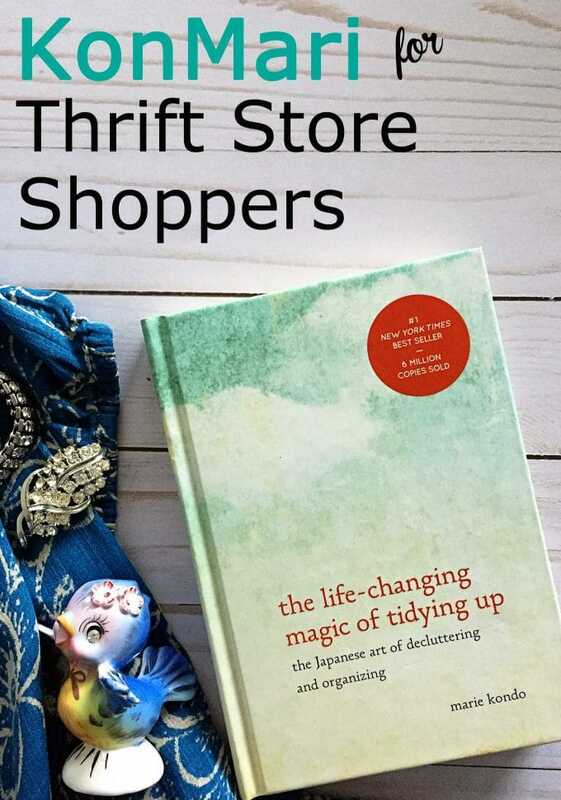 I enjoy your website on thrifting and your thoughts on the KonMari method. I have vintage Pyrex that I received as wedding gifts and use everyday, a vintage thermos that we just owned for years, a vintage Smith Corona that was mine and my Mother’s in the crawl space that eventually I will bring out into the open and use as decor like your pictures. I’ve also saved my vintage Kodak cameras and when I finish cleaning out I will bring those items out and use in my decor like you have.